Forget the warmth, sunshine and shorts. If there’s one thing I’m made jealous of by visiting a Mediterranean country, it’s the beauty and flavour of its vegetables. Peppers, aubergines, cucumbers, tomatoes, onions; you name it – it’s bigger and better. The tomatoes alone in countries like Greece and Spain almost force me to up roots. And it’s those ingredients that make the Traditional Greek Salad a dish best eaten abroad. Still, get your hands on some good quality native veggies and you’ll emerge from dinner happier than you went in. 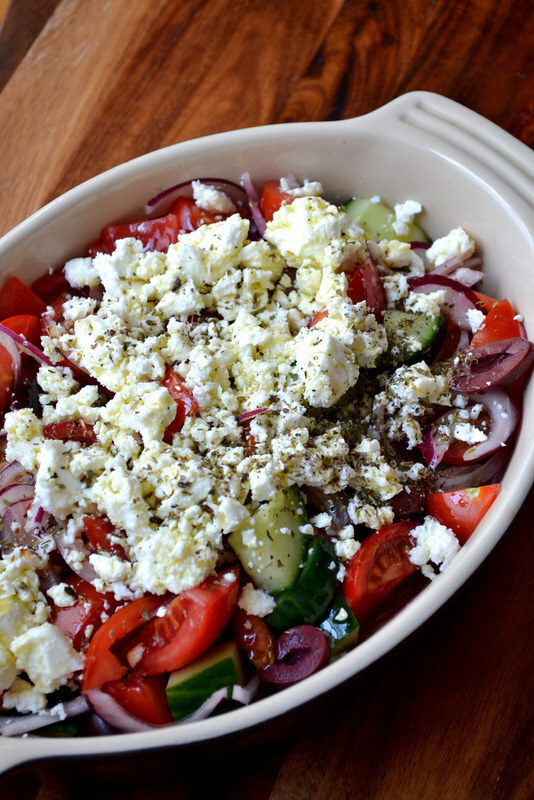 Known as Horiatiki, a truly classic Greek salad should be a rustic as a well-loved kitchen garden, backing onto the Aegean Sea. Only the onions should be finely chopped, with everything else – the tomatoes especially – hacked at in a less than delicate manner. No peeling should be done and you can even forego the crumbling of the cheese; though I prefer it a little beaten up. Naturally, don’t go easy on the salt and – good quality – olive oil. If I’ve learnt anything from Rick Stein’s latest – excellent – programme, it’s that no amount of olive oil is enough. The one area of advised delicacy, as alluded to, is the onion. The process is optional, but soaking your onions in cider, or red wine, vinegar takes the edge off their often harsh flavour. 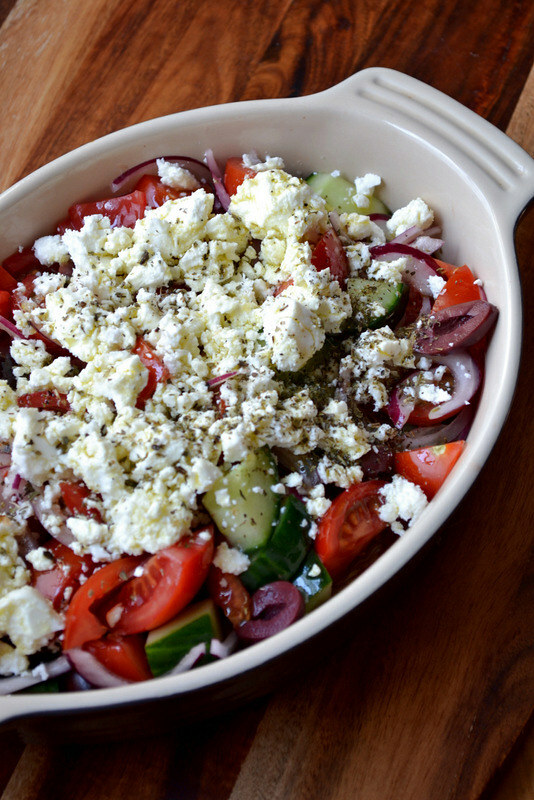 If you’re making your Greek salad a few hours ahead then don’t worry. But if it’s for immediate consumption you’d best take precaution. 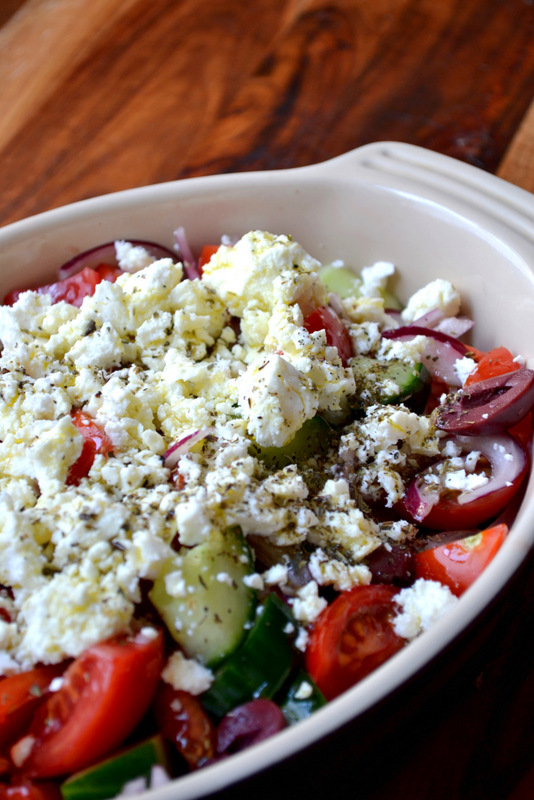 Greek salad is a truly refreshing one, and certainly frugal. But if you’re going to make it a success, then the ingredients you use must be top notch. It’s such a simple dish, that if any of its component parts aren’t up to scratch then you risk ruining it. Good olive oil is an expense, but if you use it selectively then it’s certainly a worthwhile investment. Fab. Using a bowl, soak the onion in the cider vinegar for 10-20 minutes. Meanwhile, add the tomatoes, cucumber, olives and salt to a large bowl and toss. Transfer the fresh ingredients to a serving dish, along with the onion. Crumble the feta cheese over the top. Scatter with the oregano and black pepper, and finish generously with olive oil. The more the merrier. Cost: The component ingredients here may be of superb quality, but Greek salad is so simple it easily retains its frugality. Indeed, the entire salad shouldn’t set you back more than £2.30 and, served with a few other bits, will happily feed four. 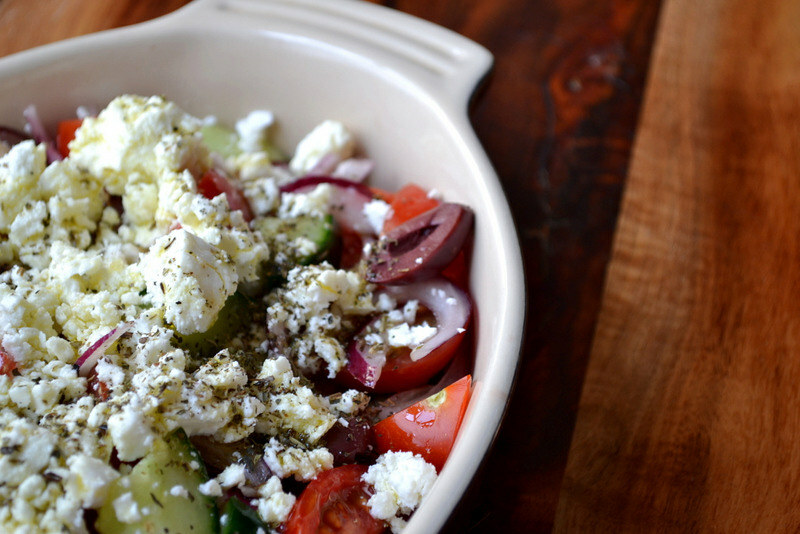 I love Greek salad and couldn’t agree more with you regarding using the best produce and olive oil you can find. I think the idea of essentially doing a ‘quick pickling’ of the onion before adding it to the salad is a fantastic idea. I should make him take me back to Greece!